Necessity really is the mother of all invention. 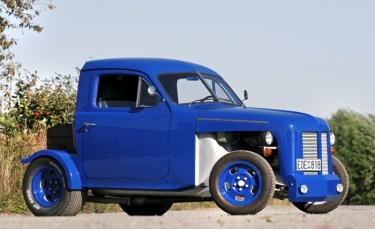 And the history of this peculiar kind of truck was born during wartime shortage. 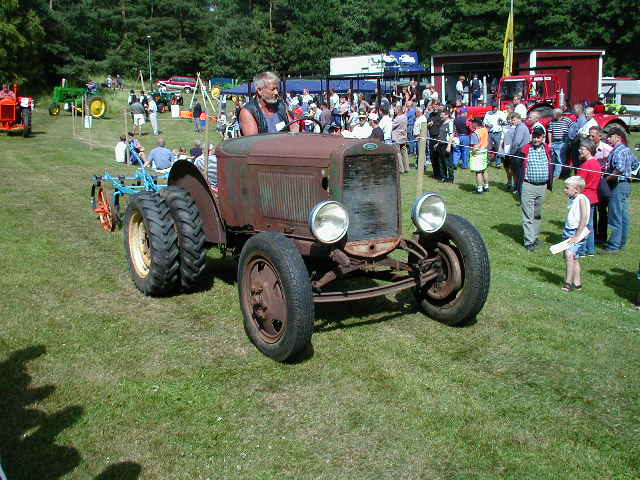 In Sweden before and during the second world war, there was a shortage of tractors and farm equipments. So, what did the farmers do? 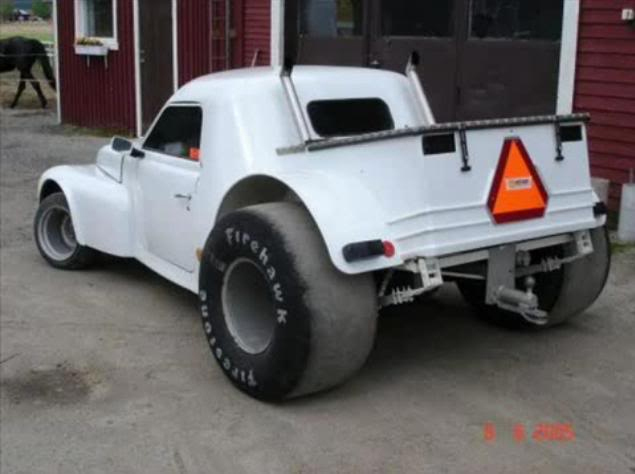 They had to make with what they had, and what they had was trucks. Tractors were made out of anything resembling a vehicle, most of them had Ford A or AA origin. The trucks were used in a similar fashion to the original Jeep and the English Land Rover, working on fields or hauling stuff around the farm. In modern times, the truck has evolved into something not that different from the Australian “Ute”. The trucks were colloquially called Epa-traktors, named after a chain of low-priced commodities. Figuratively translated to something like the Sears & Roebuck of tractors. As a side note, the Epa brand of stores gained a notorious reputation for cheap and bad products, and the brand name fell out of fashion so fast the entire chain had to rebrand itself in the early sixties. After the war, the government almost regulated the Epa:s out of existence, because god forbid, we can’t let people have too much fun now, can we? The rules called for a body on frame, a maximal wheelbase of 225 cm or about 7 feet, an unsprung rear axle, and a 10:1 gear ratio. Almost the only car suitable for those conditions during post war society and available in any kind of large quantity was the Volvo PV445, the “Duett”. And even for the Volvo, that meant the frame had to be shortened accordingly. That’s also the usual tell-tale between old school Epa:s and the newer A-traktors, the shortened wheelbase. As most of the Epa:s were Volvo based, Volvo are an almost mandatory brand in these circles. Virtually every flavor of every Volvo model ever made, someone somewhere has made into an Epa. In the middle seventies, the government wanted to phase out the Epa-traktors entirely, but public uproar made the phenomena stay. Seen as a wartime necessity, the thought was that the demand could now be provided for by “real” tractors and trucks. The thing was, in the meantime people had discovered how handy these vehicles could be, and public demand made the government change the regulations in favor of the builders. The trucks were now called A-traktors, registered as farm equipments. There was no wheelbase requisite, the rear axles didn’t have to be unsprung, and there was no set axle ratio. Above all, the requisite for building on separate frames only was done away with, enabling the use of more suitable unibody donor vehicles. However, top speed was regulated to 30 km/h (18 mph), and there had to be a token truck bed out back that couldn’t be larger than 1.25 square meter, or about thirteen and a half square feet. Also mandatory was the triangular slow vehicle sign in the back. And there was a kind of flexibly-interpreted regulation, stipulating that the intended use should not be for personal transport, nor for the transport of goods. If the intended conversion seated three abreast from the beginning, that was okay, which suited the use of larger truck bodies. But a second row of passengers were against the rules, making crew cabs unsuitable. If larger cars or vans were converted, the dead space behind the driver and passenger could not be usable in any sort of way, not for people or goods. In most cases, that meant shortening the body of the passenger compartment or cutting off the entire cargo hold of the vans. As the truck is officially made for hauling stuff, a tow hitch is mandatory. The token truck bed is officially made for taking ballast when towing large cargo. If a pickup truck was converted, that meant the bed had to be made smaller than originally intended, and the boxed in sections of the bed had to be permanent and inaccessible, making the unused dead space unavailable. All to make it as unattractive as possible to make an A-traktor conversion in the first place. And what happens when those young at heart meet stiff government regulations? 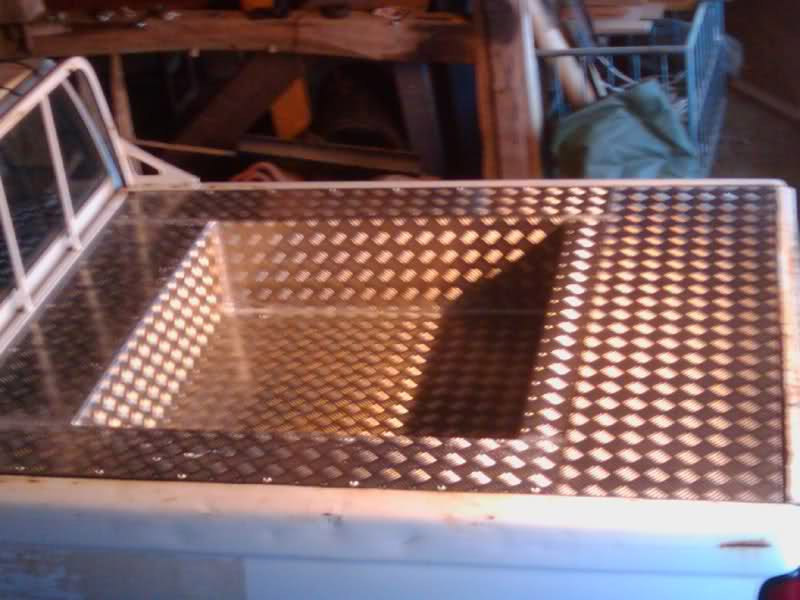 Where others meet limitations they see endless possibilities for artistic output and creative use of cutting and welding. The seemingly tough rules makes for a great playing field. So, what really is the purpose of this truck? In essence, it’s a loophole vehicle. In Sweden, the minimum age for taking a drivers license is 18 years of age. As the A-traktor is officially registered as a farm tractor, a license for those can be had at the age of 16. Essentially, it’s a car for kids not old enough to drive a real car. It’s a convenient truck for people out in the country to cruise the town and making the neighborhood unsafe for for the common man. In essence, it’s a hick town phenomena, with farm kids cruising the nearest mall or main street come Saturday night. Other users include old farmers and those that’ve had their licenses revoked for things like drunk driving and such. The taxes and insurances are almost irrelevantly low, so the car makes for a great free for all. And rest assure, though the cars are mechanically restricted not to go over 30 km/h, I have never ever seen one that is not capable of at least 50. People goes through James Bondian measures to make the trucks officially legit while in real life they almost certainly never are. Also, the making of A-traktors really is the stepping stone into the car customizing scene in Sweden. It’s an easy way in to learn the craft, and the stakes are really not that high. Many builders have gone to larger tasks after having made one, and many hotrodders have their origins in this scene. 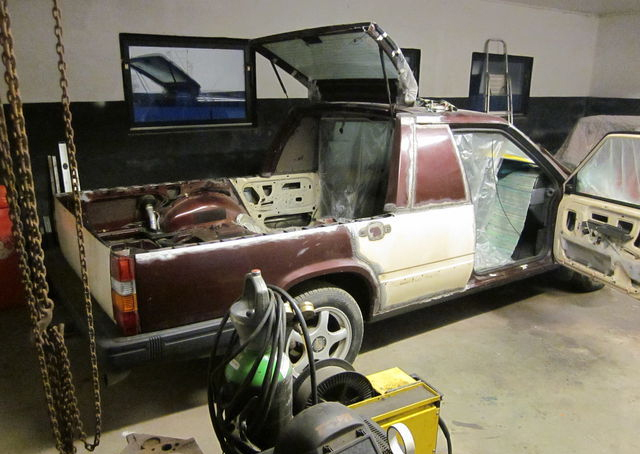 The great irony is that the time for finishing a project in many cases takes so long the owners have become old enough to drive a real car in the progress, so the trucks usually changes hands pretty fast from the older to younger generations. Some A-traktors have been rebuilt and reborn endless of times, with people adding or changing the cars in the process. This also makes for a great litmus test on current trends. With a fifty year span on regulations, the scene has seen virtually every trend come and go, from apple candy flakes to slamming and ratrodding. Prices range from perhaps a thousand dollars up to ten grand and up for concourse editions. In my next installment, I’ll try to chronicle real curbside examples of the trucks that are populating the local neighborhood. Fascinating read! I’m always interested in the lengths that people will go to circumvent rules and regulations and the creativity that results. As someone raised in Oklahoma, redneck hick capitol of the world, I can appreciate these trucks…or tractors. Very creative and attractive in their own odd way. Okie ranchers and farmers like to chop the top off old school buses to haul field hay after it has been baled. They also like the tiny Japanese import trucks for driving along their fence rows. It is safe to say they would like these Swedish creations as well! Hey now, I live in Oklahoma still, and… yeah you’re pretty much right… Those Japanese Kei trucks are street legal here now, for very similar reasons to these Swedish cars, so farmers can drive them on the road into town. Excellent exposure to yet another car culture. The early ones remind me of the doodlebugs here in the States after WWII. But, Man, those Volvo offerings are sweet! Thanks for the write up and I look forward to many more. Hey lrf, your brother Jim is a nut! You or he should do a CC about the Bus. Paul would like it. Very interesting about the doodlebugs, it’s basically the same thing. I guess news didn’t travel that fast, so the farmers around the world had to reinvent the wheel all over again. What do they say about convergent evolution? Thank you Ingvar for your contribution on these little-known vehicles. 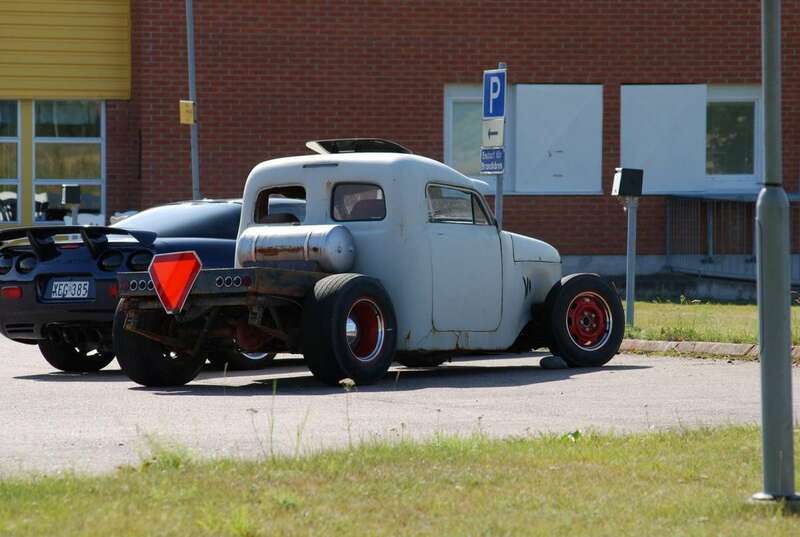 I lived in Sweden for the best part of the 1990s and remember well these funny little things going down the streets of small rural towns (and coexisting nicely with the full-scale gas-guzzlers of the local “raggare”). Congratulations for a very (and I mean very, very) good site. Great piece. A whole new world…. 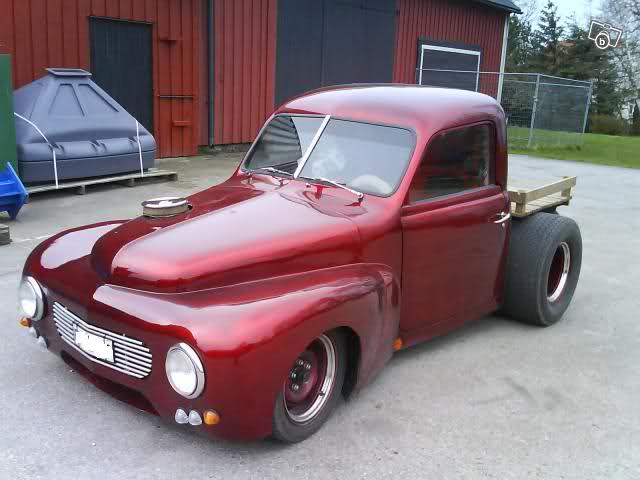 We had something like this when I was young, my dad made it from a ’56 Studebaker Champion. 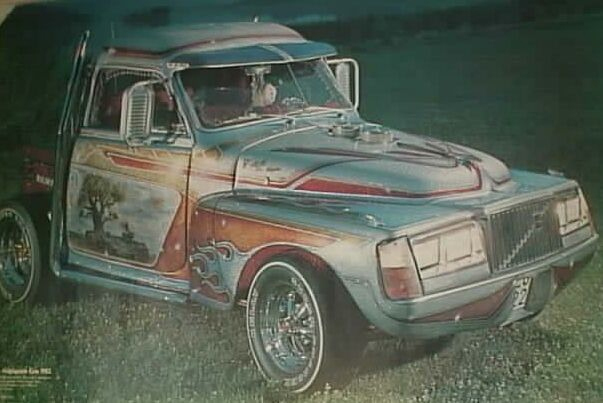 He cut off the roof and entire body aft of the A-pillars, shortened the chassis by a foot or so, and built a pickup box out of wood. That thing was practically invincible off road. The candy apple red truck and the white one look like they belong on a dragstrip, but they’re limited to 30km/h? Almost seems like a waste, but they sure look neat though. Looks like a great way for a farm kid to get around. Some pretty obtuse regulations though. Nice looking rigs. Ingvar, I’m guessing doodlebugs were a global phenomenon. There were the remains of a Model A doodlebug on my grandfathers farm. 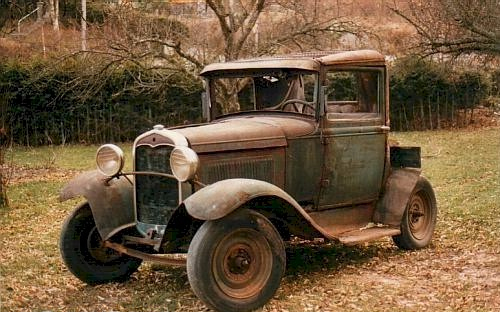 Back in the late 50’s I found a Model T Ford version in a barn that belonged to a friend’s grandfather. It had not been run for perhaps 20 years and the great old guy let me get it going and drive it around his rather large farm. It was quiet a adventure as it was built with a truck transmission directly coupled to the Ford’s T (planitary) gearbox which had to be coaxed into neutral to act as a clutch to shift the second transmission! Thanks for this article. I just blogged about the EPA-tractor and posted a link to your informative article. That last A-Traktor looks AWESOME! Do you know anywhere in Sweeden where I can get one like it? I remember when me and My friends drove around in theese. Except most of them were A-traktors since true EPA-traktors was quite rare. Choose any district or “hela Sverige” – fordon – mopeder & a-traktorer – A-traktorer and you are finished. Again, awesome reading and god day to you all! Nice to see it up again. Though I read this site daily, I really wish I had the strength to write more articles. I have at least a dozen in my head, but alas, I can not reach my creativity button and have them written down. It comes and goes, it’s like ebb and flow with me. I’ll see what I can do later this fall. But it’s really nice to see something up there that I wrote. Thanks Paul, or Steven perhaps? Or whoever put it up there. We have about ten times the number of visitors to CC per month now then we did then, so many of our older posts deserve another airing. But others find their way to them all the time via google searches. I often feel the way your do, but I’m kind of stuck now. I created my own monster, and it wants to be fed regularly. One of these days…..
Gotta love the Swedes. Too bad there aren’t more of them. Once sold a ’73 Eldo convertible to a Swedish father and son duo. They had a whole shopping list of vintage American cars and pickup trucks to buy and take back to Sweden to restore. I asked why he wanted a 10 mpg Eldo and other similar vehicles to drive in a country where gas cost $8 USD per US gallon. He said, “We just drive them on week ends for show.” What’s not to love. For a while, at least back when it really mattered, the Swedes actually went into the car business and for a time made some excellent stuff. You could tell because during that time the Swedish currency was stronger than dirt. This sure hits me. I sort of wish I had made one of these instead of buying a tractor that became a money pit. A lot more useful. Fascinating! Thanks for writing that – I look forward to the next installment. Greal article. My daughter was the last in the family to actually have an A-tractor. I did stryggle to explain the phenomenon to foreigner bur you did a great job. A small correction though. Nowadays you can drive one on a scooter license that you can get already at fifteen years of age. And that the abundance of affordable japanese pickups to easily convert has made the hobby even stronger, also cities.